Yesterday I boldly, and confidently, stated that Angie Miller would win this listless season of American Idol. I felt sure that the impression she made in Vegas, singing her original song at the piano, would be enough to drive her to victory, especially since over the last few weeks of the competition the top girls seemed less to be competing with each other than settling into the groove of the kind of artists they planned to be once the show was over. In my twelve seasons of fanatical Idol viewing I’ve rarely been this shocked. I accurately predicted Chris Daughtry’s ouster in Season 5. I saw Melinda Doolittle’s elimination coming in Season 6. I even guessed Kris Allen would take home the victory over Adam Lambert in Season 8. In fact, not since the three divas were in the Bottom 3 during Season 3, and before that Tamyra Gray was eliminated in Season 1 in the first true Idol surprise, have results literally made my jaw drop to the ground. Don’t get me wrong — despite my shock, I’m actually thrilled with this result. Candice has given the best, and most consistent, performances throughout the season. Her rendition of “Somewhere” last night was absolutely stunning. And Kree has a real future ahead of her as a country star. She’s got an amazing, soulful voice, and an easy stage presence, and it’s no stretch to picture her performing, as Nicki Minaj imagined earlier in the season, at an awards show in the near future. I just truly believed Angie was going to win. And there was certainly no way I thought she would be sent home tonight, not after never having set foot in the Bottom 2. No way, no how. Clearly I overestimated the long-term impact of Angie’s Vegas performance. And I obviously undervalued the impact of those hometown videos, and the fact that they were being shown at length for the first time in the show’s history during a performance episode instead of a results show. While it was clear that Candice and Kree’s stories were much more moving than Angie’s, I (erroneously) believed Angie was so far ahead of the field in terms of votes it wouldn’t matter. Lesson learned! Based on her reaction, I think Angie thought she was going to win too. And as the always entertaining Dave Holmes wrote in his recap today, “in defeat, Angie finally delivers on her promise.” Her elimination actually allowed her to access the emotion she had been missing throughout the season. It’s interesting to imagine what might have been if the emotional centerpiece of Angie’s hometown video had not been her missing her cat. Just saying. So, though it’s been an incredibly odd and ultimately underwhelming season despite the undeniable talent of the Top 4 women, I think we’re in for an entertaining finale next week, featuring two very worthy contestants. It just so happens neither of them will be the person I predicted would wind up the winner. 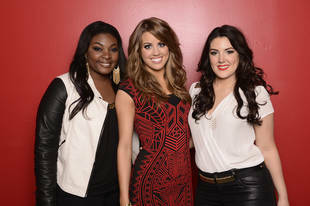 This entry was posted in Television and tagged American Idol, Angie Miller, Candice Glover, Kree Harrison, Mariah Carey. Bookmark the permalink.